Picture: A suit in the Altstadt Hotel in Vienna. How do you define a superb hotel? My definition is: it makes women jump with joy upon entering one! One hotel that fits this definition is the Altstadt Vienna hotel near the "Museum Quartier". It is located in a hundred year old building and it is decorated by a skillful interior designer. The historical rooms with high ceilings are well lit with modern lamps, painted with pleasingly bright wall colors and sport big bath tubs. The junior suite we stayed in was so pleasant that we gladly stayed in on a rainy day. Also a plus point is that everyday between 3 and 7pm, one could help themselves to some tea and cake in their wonderful and homely lounge area. Picture: Affordable, hand-made and goodyear-welted shoes in Vienna. Handmade bespoke shoes from Scheer might not fit everyone's budget but there is a good alternative. Two brothers operate a shoe store in Vienna by the name of Robertino. The older brother learned shoe-making in Vienna and they have a line of shoes with different lasts. Their newest last is long and elegant and perfectly fits my wide feet. One can choose between different leathers and models. I got a brown scotch-grain one during sale for a very reansonable €280. This is truly a bargain for well-made goodyear welted leather shoes. Their address is: Wollzeile 23, 1010 Vienna (right behind the Stephansdom). Picture: Bespoke shoes made on-site in Vienna. While I am still waiting for my bespoke Balint shoes (I ordered them in January) I happened on another bespoke shoe maker in Vienna. Rudolf Scheer & Söhne in Vienna belongs, together with John Lobb in St.James in London, to the top bespoke shoe makers in Europe. It used to make shoes for the Austrian royals and it was founded in 1816. R. Scheer for example made shoes for the Austrian emperor Franz Joseph 1. The venerable company looks back on almost 200 years of shoemaking-tradition. In contrast to Balint, who produces in Romania, all shoes are made on location in central Vienna. Young Markus Scheer of the owner family (7th generation) takes normally three measurements of your feet in six months time and he also makes the rough first cut of the last. The shoe is then assembled from over 200 parts. THe shoes are made completely by hand with only very few machinery involved. The result is not only stunning but also unique and highly comfortable to wear shoes. A shoe will set you back at least €3000 and it comes with free shoe cleaning service and a cleaning set. 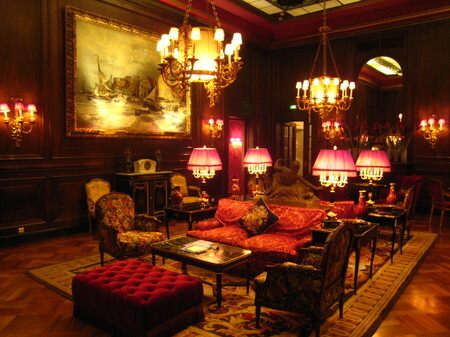 Picture: Sit down once, never leave again: the legendary Sacher Hotel in Vienna. I recently visited Vienna and stayed at the legendary Sacher Hotel that sells the even more legendary Sacher Torte (cake). Yuup, the hotel is as nice as the cake. Try it! 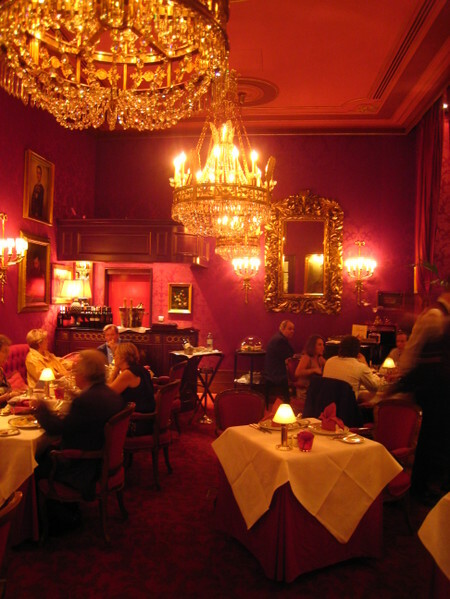 Picture: The famous Red Bar Restaurant at the Sacher Hotel.